.NET Standard and .NET Core – What and Why? Unless you have been living under a rock, you must have heard about .NET Standard and .NET Core by now. .NET Standard (https://www.dotnetcurry.com/dotnet/1377/dotnet-standard-2-xaml-standard) is a formal specification of .NET API’s that a Framework must implement to be .NET Standard compliant. This specification is important because it establishes a uniformity in the .NET ecosystem. In the near future, Universal Windows Platform (UWP) vNext will also implement the .NET Standard spec. The .NET Standard makes it easy to write .NET code that can be shared across all these .NET implementations. So as a developer, if your write a .NET Standard Class Library, you can be rest assured that it will work on all the four .NET implementations listed above, as well as the new ones implemented in the future. In November 2016, .NET Core 1.1 was released at the Connect() event. This was the first new minor version of .NET Core - a cross-platform, open source, and modular .NET platform for creating modern .NET applications. Unlike the LTS (Long Term Support) version 1.0, .NET Core 1.1 was categorized as a “Current” release. While LTS releases have a 3-year support period from the original release, or 1 year from the next LTS release; the “Current” releases are only eligible for support as long as their parent LTS release support period or 3 months after the next “Current” release, whichever comes first. The two versions can safely be installed side-by-side, so that individual applications on the same machine can use either one. The focus of this release was performance. The big news was that ASP.NET Core is now included in the TechEmpower web framework benchmarks, and is the fastest mainstream full stack framework in the Plaintext category. With MVC filters, you can apply middleware only to specific controllers or actions. Two new middleware were included: URL rewriting and response caching. Compiling views during the publish process is supported. Editorial Note: You may want to read https://www.dotnetcurry.com/aspnet/1329/aspnet-core-11-what-is-new to learn more on ASP.NET Core 1.1. Entity Framework Core 1.1 has built-in support for connection resiliency and SQL Server memory-optimized tables. Thanks to improved LINQ translation, the database engines can successfully execute more queries than before. New APIs were added for explicit loading, mapping to fields and a few other features. Final version of MSBuild tooling for .NET Core was released in March 2017 as part of Visual Studio 2017. This means that standard .csproj project files can be used instead of project.json. To better align the two formats, MSBuild now supports wildcard-based inclusion of files for folder based projects, and direct NuGet package references. A wizard for migrating project.json projects to .csproj is available as well. In May 2017, .NET Core 2.0 Preview was released at Build 2017 event. Three months later, on August 14th, .NET Core 2.0.0 final version was made available. The main focus of this first new major version of .NET Core is increased source level compatibility with the full .NET framework. To achieve that, the team added over 20000 APIs from .NET framework, which were missing in .NET Core 1.1. At the same time it introduced .NET Standard 2.0, which will be implemented by both .NET Framework and .NET Core 2.0 and will allow compatible .NET framework libraries to be used directly from .NET Core 2.0. You can read more about .NET Standard 2.0 in my article about it for Dot Net Curry (DNC) magazine. .NET Core 2.0 is also accompanied by Entity Framework Core 2.0 and ASP.NET Core 2.0. Entity Framework Core 2.0 is mostly about improvements to LINQ implementation and reduced functionality gap between Entity Framework 6 and Entity Framework Core. ASP.NET Core 2.0 is reintroducing Razor pages and features simplified startup code. Both C# and F# are fully supported for .NET Core 2.0 development. The same project templates are available for both languages, however Visual Studio 2017 is not yet fully compatible with .NET Core development in F#. While projects can be built and debugged, IntelliSense does not yet work correctly for F# and will be fixed in one of the future Visual Studio updates. For the time being, Visual Studio Code (https://www.dotnetcurry.com/visualstudio/1340/visual-studio-code-tutorial) is a better alternative – Ionide-FSharp extension has full IntelliSense support, while the C# extension provides the .NET Core debugger. Visual Basic support is also being added to .NET Core: it can be used for developing .NET Core based class libraries and console applications. Better performance is also a high priority: Visual Studio 2017 starts faster, has shorter load times for solutions, and a faster, more componentized installer. To further speed-up initial loading of large solutions, lightweight solution loading can be enabled for them, which defers the full loading of projects to a later time when they are first needed. Extensions can also largely affect the overall responsiveness of Visual Studio. The new performance-monitoring feature will now warn the user about extensions which slow down Visual Studio. New versions of C# and Visual Basic provide many new language features, as described in my previous article on C# 7.0 for Dot Net Curry (DNC) magazine. Visual Studio Tools for Unity are now available as a part of a separate Unity workload in the Visual Studio installer. Among other improvements, the code editor now features full syntax coloring and IntelliSense support for Unity event functions. a new Data Science and analytics workload. With the release of C# 7.0 as part of Visual Studio 2017, the planned release cadence for new language versions has changed. Between the major versions, several new minor versions will be released, which will allow smaller features to be released sooner, not having to wait for a new major language version to be ready. According to this new policy, Visual Studio 2017 update 15.3 introduces C# 7.1 with several new features: asynchronous Main method, default literal, inferred tuple names and pattern matching with generics. Other small features are already planned for C# 7.2, such as read-only by-reference argument passing and named arguments in non-trailing positions. The next major version, C# 8.0, is currently planned to support safe nullable reference types and default interface methods, which promise to bring trait-like behavior to C#. 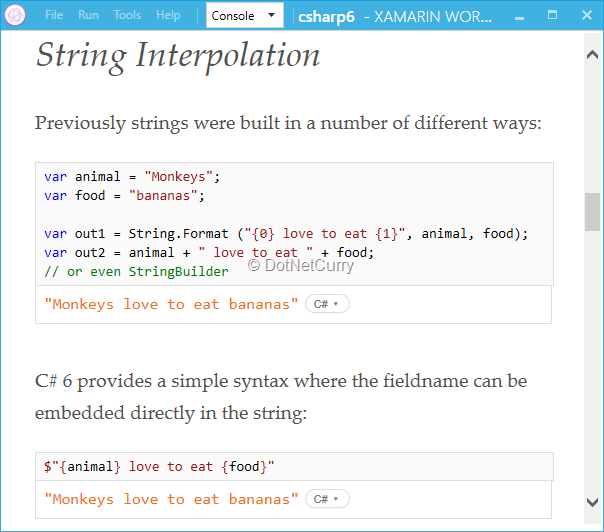 Editorial Note: A good article with an overview of what's new and upcoming in C# 7.1, 7.2 and 8.0 can be found here www.dotnetcurry.com/csharp/1401/csharp-7-1-csharp-8-new-features . 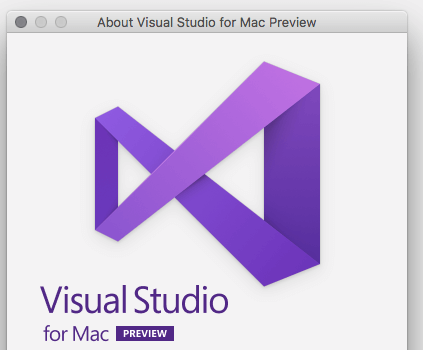 The Visual Studio product family got a new member: Visual Studio for Mac. The application is an evolved version of Xamarin Studio, more closely aligned to the Visual Studio experience on Windows. It supports development of Xamarin based mobile applications, and their cloud backends in .NET Core, using either C# or F#. It features the same Roslyn powered compiler, IntelliSense code completion and refactoring experience as Visual Studio. The same MSBuild project format allows for seamless sharing of projects between Visual Studio on Windows and Mac. There’s also a preview of the next release available for download. It adds support for Unity development, publishing ASP.NET Core applications to Docker and development of Azure Functions. The Xamarin team recently released stable versions of several new tools. At Build 2017 event, another new Xamarin tool was announced to be available in preview: Xamarin Live Player. It comes with an accompanying mobile application for iOS and Android. With some limitations, it allows direct deployment of Xamarin applications from the IDE to your device without having to create and deploy the full package for every change. backend services for authentication, data storage and push notifications, with more coming in the future. It currently supports UWP, iOS and Android applications written in C#, Objective-C, Swift, Java, Xamarin or Reactive Native. Support for Cordova applications has been announced. Direct deployment to Google Play store is already available, support for App Store, Windows Store and Intune has also been announced. Tizen is Samsung’s Linux-based open source operating system, used in over 50 million of their devices: smart TVs, wearables, smartphones and IoT devices. At Connect() in November 2016, Samsung announced its intention on collaborating with Microsoft to bring .NET Core to ARM devices, and add Tizen support to Xamarin.Forms. Since then Samsung has released four preview versions of Visual Studio Tools for Tizen. They provide an alternative to existing C and HTML 5 based programming models for Tizen. Mobile and TV application development is already supported. Support for other types of devices will follow in the future. All the development is done in C# with .NET Core (2.0 Preview is already supported), Xamarin.Forms for the user interface, and wrappers for many native APIs to access device specific functionalities - everything with full IntelliSense support. Debugging takes advantage of device emulators, which are included in the download. The official release is planned for the end of 2017 as part of Tizen 4.0, when the .NET Core runtime will also ship to devices. Microsoft continues to offer a great set of benefits and tools for any developer, any app, and any platform. Since their inception, Microsoft has been using Connect() and Build events to announce many important development related releases. The last incarnation of both events was no exception. From Visual Studio 2017 and Visual Studio for Mac to new Xamarin tooling and new .NET Core versions, there was something of interest for any developer already working with Microsoft tools or technologies. At the same time, as Microsoft expands its focus from Windows to other platforms, these announcements have become increasingly interesting to developers who are not in Microsoft’s ecosystem yet. The new Microsoft is showing that it isn’t afraid of making big bets, and delivering on them. Wake up and Code!